Under the Big Oak Tree: Buffalo Chicken Pizza with Pillsbury Artisan Crust ~ and a Giveaway! 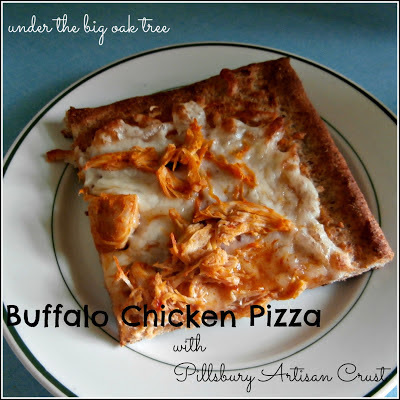 Buffalo Chicken Pizza with Pillsbury Artisan Crust ~ and a Giveaway! Ever since I was a kid, pizza has been one of my favorite meals. We didn't eat pizza every week, but when we did it was always takeout and always on Friday nights. Pizza delivery and a video rental was always a perfect start to the weekend! After I moved out of my parents' house, Friday night pizza was still a tradition. 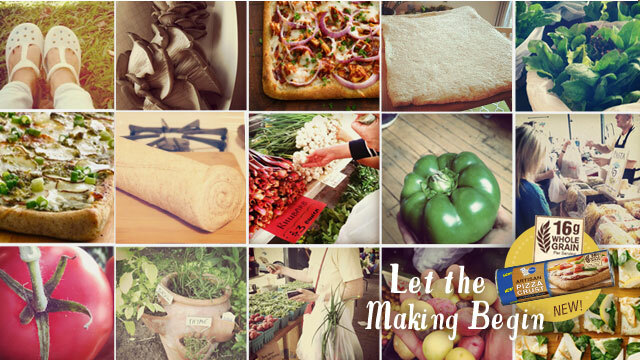 The only difference was that we didn't always do takeout pizza. Occasionally, we would pick up a pizza crust and add our own toppings. Store bought pizza crust and leftovers for toppings made preparing our own pizza easier than finding the menu for the local pizza place! 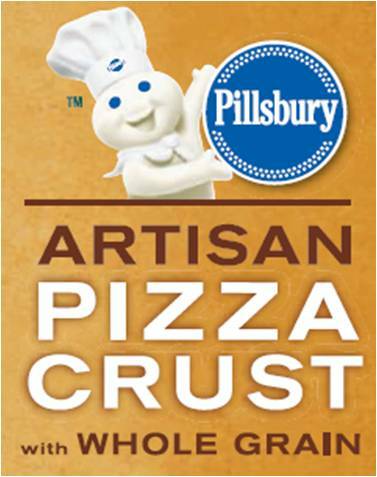 Now that we're trying to eat healthier, I was super-excited to hear that Pillsbury now offers a whole grain Artisan Pizza Crust with 16 grams of whole grain per serving! Thanks to General Mills, Pillsbury and MyBlogSpark, we had the opportunity to try the Artisan crust along with a bunch of other great gifts (but we'll talk about those later). Since we've both been in the mood for Buffalo Chicken Pizza from our local pizza place, I saw this as the perfect opportunity to save some cash and make our own at home. I started by making a crock pot full of Shredded Buffalo Chicken. When it was time to shred the chicken, I reserved about a 1/4 cup of the sauce. After unrolling and pre-baking the crust, I used a silicone brush to coat the top of the crust with some of the reserved sauce. I then topped with some reduced fat mozzarella cheese. The shredded buffalo chicken is next. Once the pizza was assembled, I poured some of the reserved sauce over the top of the pizza, being careful not to add too much. I wanted to make sure the pizza was full of buffalo flavor without getting soggy. The result? A deliciously crunchy, whole grain crust topped with ingredients that suits our family perfectly! I mean, what pizzeria is going to use reduced fat mozzarella on your pizza delivery? Let me tell you, that pizza didn't last long either! The two of us polished off that 6-serving pizza in no time! It was soooo good! I am very pleased that we bought a spare crust when we picked up the one to review! I'm thinking our next pizza will be a Cheese Steak Pizza like the ones we used to get when we lived in Philly! I'll be sure to let you know how that one turns out, too! For more pizza making ideas and flavor combinations, check out Farmer's Market Ideas from Pillsbury. 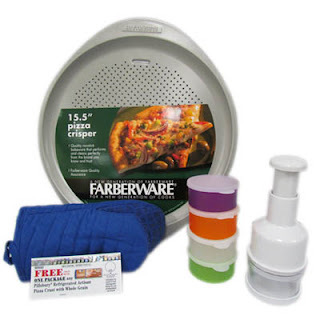 As I mentioned earlier, along with the coupon for the Pillsbury Artisan Crust, my prize pack (shown below) included a bunch of great kitchen items perfect to help with making great pizzas! I like either spinach or chicken. Yum! Banana peppers are my absolute favorite topping!